Old joke: Where do the Swiss keep their armies? STOCKHOLM (AFP-Jiji) — Sweden is to reintroduce compulsory military service, seven years after abandoning it, to respond to global security challenges including Russia’s assertive behavior in the Baltic Sea region, Stockholm said Thursday. Sweden has had a professional army, staffed by volunteers, since 2010. “We saw that our units could not be filled on a voluntary basis. A decision had to be taken to complement the [volunteer] system, which is why we are reactivating conscription,” Hultqvist said. A non-NATO member, Sweden has not seen armed conflict on its territory in two centuries. It put conscription on hold in 2010 after it was deemed an unsatisfactory way of meeting the needs of a modern army. In the past two decades the military’s budget has been slashed as its mission was revamped to focus more on peacekeeping operations abroad and less on the country’s defense. General James Mattis. General Mattis retired from the Marine Corps as a full general in 2013, where he served as the eleventh commander of the United States Central Command. He also served as the commander for NATO supreme allied transformation, and as commander of the United States Joint Forces Command. Mattis is an Annenberg Distinguished Visiting Fellow at the Hoover Institution. 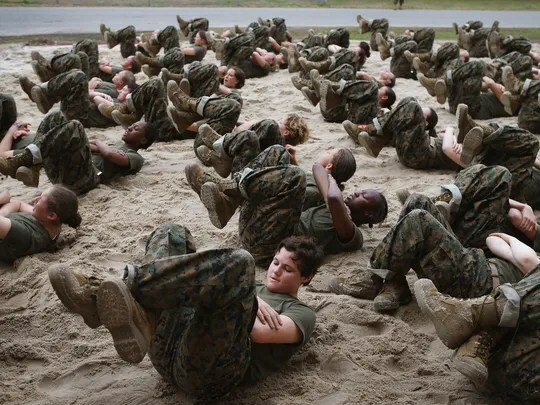 Gina Harkins reports: The Marine Corps has been ordered to come up with a plan to make its enlisted entry-level training coed, and to make its job titles more gender-neutral following the recent move to open all military combat roles to women. In a Jan. 1 memo to Marine Commandant Gen. Robert Neller, Navy Secretary Ray Mabus requested a “detailed plan” on how the service will fully integrate its boot camp and Officer Candidate School. The plan is due Jan. 15 and will be implemented by April 1, the memo states. In a second memo from Mabus to Neller on the same day, the SecNav directed the Marine Corps to conduct a full review of its military occupational specialty titles in an effort to ensure that they are gender neutral. US soldiers and ‎Peshmerga forces have freed 70 hostages in the ‎Kurdish region of North ‎Iraq.. The Pentagon says they were being held by ‎Daesh in a village near the city of Hawija. A spokesman says at least 20 Daesh(isis) militants were killed in the raid. One US soldier also died. It was the first American combat death since the US’ withdrawal from Iraq in 2011. Fight Doesn’t Match Tory Rhetoric: Canadian military aircraft have flown 1,320 sorties, or individual missions, over Iraq and Syria since last year. That accounts for 2.7 per cent of the 47,705 total sorties flown by coalition aircraft since the war against ISIL started. Despite Conservative warnings about the “horrific” threat posed by the ISIL, new figures show Canadian military aircraft have conducted less than three per cent of all coalition missions in Iraq and Syria. The war against ISIL figured prominently on the campaign trail Monday as Prime Minister Stephen Harper used a stop in Markham, Ont. to pledge that a re-elected Conservative government would provide more assistance for religious minorities and refugees in the Middle East. Harper went on to criticize Liberal leader Justin Trudeau and NDP leader Tom Mulcair for promising to end Canada’s participation in the U.S.-led bombing campaign against ISIL, saying that humanitarian aid alone won’t solve the crisis. But a Citizen analysis raised questions about whether Canada’s military contributions in the fight against ISIL match Harper’s warnings. Defence Department figures show Canadian military aircraft have flown 1,320 sorties, or individual missions, over Iraq and Syria since last year. That accounts for 2.7 per cent of the 47,705 total sorties flown by coalition aircraft since the war against ISIL started. An animation made from the audio from the Opie and Anthony radio show. Louis CK confronts Donald Rumsfeld about the accusations of being a lizard. When Does a Hack Become an Act of War? WASHINGTON— Damian Paletta reports: A tremendous number of personnel records—including some quite personal records—have likely been stolen by computer hackers. The White House won’t say who did it, but a number of U.S. officials and even some lawmakers have said all signs point to China. Right now, the White House and Congress are trying to ascertain what was stolen and how to protect people whose identifies have been compromised, not to mention their “foreign contacts” that are listed on the security clearance forms that could now be on the hard drives of the hackers. But very soon a much different question will be asked in Washington: If the White House finds out who stole the information, what will President Barack Obama do about it? Michael Auslin writes: The news flashing through Washington, that Chinese hackers stole up to 4 million federal employees’ personal information, should elicit more than just a shrug from the Obama administration. The breach is yet more evidence that Beijing sees the US as an adversary and is unworried about any response aggression will elicit from the White House. Whether it’s economic espionage, security challenges, or now hacking US government websites, Beijing is testing, probing, and undermining America in any way that they can. Just a week ago, the Chinese were recorded warning a US Navy surveillance plane away from the reclaimed islands they have been building in the South China Sea. Video footage showed air strips on the islands, while subsequent reports indicated that China had already put some weaponry there. General Mullins told Bowe Bergdahl’s closest comrades to sign non-disclosure statements on Bergdahl’s behavior before he deserted his platoon. A senior Islamic State (IS) member has been killed and his wife captured in a raid in eastern Syria by US special forces. Abu Sayyaf, who helped direct oil, gas and financial operations for IS, as well as holding a military role, was killed when he engaged US forces, according to a Pentagon statement. The operation in al-Amr was authorised by President Barack Obama and was carried out by forces based in Iraq. The BBC’s Rajini Vaidyanathan says Abu Sayyaf oversaw IS’s “illicit oil and gas operations” – a key source of the group’s funding. Bill Gertz reports: China’s military plans to produce nearly 42,000 land-based and sea-based unmanned weapons and sensor platforms as part of its continuing, large-scale military buildup, the Pentagon’s annual report on the People’s Liberation Army (PLA) disclosed Friday. The Wu-14, designed to deliver nuclear weapons through U.S. missile defenses, was first disclosed by the Washington Free Beacon, which reported on three tests conducted in 2014. In 2013, a Ferguson profile of Ted Cruz included a devastating section in which the journalist, trapped in cars and green rooms with his subject, realizes that Cruz only speaks in stump speeches, and won’t … stop … giving … them. I remember reading the Cruz profile, “Washington Builds a Bugaboo” in in The Weekly Standard back in 2013, and the impression it left was permanent. Even now, it’s hard to look at Cruz without recalling the unflattering depictions of Cruz’s unyielding conversational style and tone-deaf careerism. It’s a good cautionary tale. Read the whole thing here. Several times a day, especially if he’s out travelin’ and talkin’ to folks, as he always is when the U.S. Senate isn’t in session, Ted Cruz will stand before an audience and reflect, seemingly for the first time, about the generational shift taking place in the Republican party. “I call them the Children of Reagan,” he says. He means the rising group of Republican officeholders who came to political consciousness during President Reagan’s two terms. He rattles off their names: “young leaders” like Paul Ryan, Rand Paul, Nikki Haley, Mike Lee, Scott Walker . . . and then sometimes he’ll pause, letting you wonder if he’s leaving out any of the Children’s names. Sometimes a helpful fan in the audience will volunteer it, to general appreciation from the crowd. Among that tiny fraction of Americans who are paying attention to such things, Cruz seems to be the only person who is forgetting Ted Cruz’s name. When you follow him around, however—for he is in constant motion, from Iowa to New Hampshire to every corner of Texas—this nasty fellow you’ve been reading about, the caricature Cruz, never appears. If “Ted Cruz” didn’t exist, professional Democrats and the mainstreamers in the Washington press corps would have to invent him. And, in a way, he doesn’t, and they have: Indeed, the invention of Ted Cruz as Republican bugaboo makes an excellent case study in how partisan journalism and politics commingle these days, as jittery Washington prepares for the post-Obama era. Already the litany of Cruz’s extremism has become an item in the progressive catechism. Most of it involves alleged violations of Senate etiquette, and it’s useful to glance over a few of them, to see how the legend grows. The unnerved New Republic reporter mentioned above was alarmed in particular by Cruz’s questioning of soon-to-be defense secretary Chuck Hagel during Hagel’s confirmation hearings. At the hearing, Cruz asked Hagel whether he and Freeman had ever worked or junketed together, as press reports suggested. Hagel said no. Cruz moved on. “Those old enough to remember, or who are familiar with, the history, will recognize Cruz’s line of attack as classic McCarthy tactics,” wrote TNR’s reporter. The mention of McCarthy is catnip for a good mainstreamer. “The Reincarnation of Joe McCarthy?” wondered a columnist for Forbes. The mere scent jogged the memory of a left-wing reporter for the New Yorker,who, Pavlov-style, wrote a story headlined: “Is Senator Ted Cruz Our New McCarthy?” She dug out old notes she had taken at a speech Cruz gave to a group of right-wingers a couple years before. The New Yorker’s reporter didn’t mention it, but other people who were there say Cruz’s informal speech was boisterous and funny, tailored to an audience of like-minded ideologues. Just as a mention of Joe McCarthy thrills people on the left, so the right delights in mockery of Harvard, especially its law school—and especially if the speaker, like Cruz, is a graduate in good standing. Having been found guilty as a McCarthyite, Cruz is of course granted no license for hyperbole, even among friends (and donors!). When Cruz attended Harvard Law, in the mid-90s, it was still the intellectual locus of a dying movement called Critical Legal Studies that was explicitly inspired by Marx, whose other followers, history shows, seldom reconciled themselves to the U.S. government. Earnestly, with that mock disinterestedness that characterizes the most dutiful of the mainstreamers, the reporter got an “equal-time” comment from a spokesman for the law school. The spokesman confessed to being “puzzled by the senator’s assertions.” For the record. The U.S. Defense Department confirmed it runs a program to monitor the body language of world leaders, including Russian President Vladimir Putin. News of the research project, which is called “Body Leads” and run by the Pentagon’s internal think tank known as the Office of Net Assessment, was first reported in an article by Ray Locker of USA Today. Pentagon Press Secretary Navy Rear Adm. John Kirby on Friday confirmed the existence of the program, which costs about $300,000 a year. He said it’s designed to help U.S. officials get a better understanding of world leaders’ “decision-making processes.” But, he added, it’s not used to inform any policy decisions. “Mr. Marshall is an out-of-the-box thinker who likes to study all kinds of issues,” Kirby said during a press conference, referring to the 92-year-old Andrew Marshall, who directs the office and was first appointed to the position during the Nixon administration. In a recent organizational shakeup, Marshall now reports to Under Secretary of Defense for Policy Michael Lumpkin rather than Defense Secretary Chuck Hagel. Julian E. Barnes and Maria Abi-Habib reporting: An American and a South African held hostage for more than a year by al Qaeda’s Yemen branch were killed during a U.S. special operations forces raid Friday night, in the second rescue attempt in as many weeks. Luke Somers, 33 years old, was killed by militants, U.S. Defense Secretary Chuck Hagel said Saturday. Several members of al Qaeda in the Arabian Peninsula, or AQAP, were also killed in the raid. South African teacher Pierre Korkie was also killed in the raid, according to a charity that had been trying to help negotiate his release. “Both Mr. Somers and a second non-U.S. citizen hostage were murdered by the AQAP terrorists during the course of the operation,” Mr. Hagel said in a statement. A U.S. official said Mr. Somers was shot by militants as the raid unfolded and wasn’t killed in crossfire. It wasn’t immediately clear where Mr. Somers’s remains were. Scott Shackford writes: This morning’s news cycle has temporarily shifted away from fretting about what might happen in Ferguson, Missouri, to the news that Defense Secretary Chuck Hagel is resigning after serving less than two years. The officials described Mr. Obama’s decision to remove Mr. Hagel, 68, as a recognition that the threat from the Islamic State would require a different kind of skills than those that Mr. Hagel was brought on to employ. A Republican with military experience who was skeptical about the Iraq war, Mr. Hagel came in to manage the Afghanistan combat withdrawal and the shrinking Pentagon budget in the era of budget sequestration. Taken as a whole, the original New York Times story paints a pretty damning picture of the White House’s national security policy setting. Mr. Hagel, so long as he was a loyal foot soldier for the President, was okay even if he was on the outside of the White House cool kidz team. But the moment Hagel spoke up on ISIS, contradicting the White House, it was game over. In other words, Chuck Hagel was not fired for incompetence. He was fired for telling the truth on ISIS — calling it an “imminent threat to every interest we have,” thereby forcing Barack Obama to deal with a threat he very much would like to ignore. Scott Shackford: …But now “the next couple of years will demand a different kind of focus,” one administration official said, speaking on the condition of anonymity. He insisted that Mr. Hagel was not fired, saying that he initiated discussions about his future two weeks ago with the president, and that the two men mutually agreed that it was time for him to leave. But Mr. Hagel’s aides had maintained in recent weeks that he expected to serve the full four years as defense secretary. His removal appears to be an effort by the White House to show that it is sensitive to critics who have pointed to stumbles in the government’s early response to several national security issues, including the Ebola crisis and the threat posed by the Islamic State. Here’s why China is Intentionally Provoking its Asian Neighbors and the U.S.
Goodbye to the Warthog and the Dragon Lady? The current proposed defense budget from the Obama administration would mothball the US fleets of venerable A-10 close air support (CAS) aircraft and the even more venerable U2 spyplanes (of Francis Gary Powers fame). Miltech fans like me become attached to quirky planes like these, whose specialized missions lead to extreme designs (in the case of the A-10, basically a flying tank, and for the U2, an elegant jet-powered sailplane). Both aircraft have survived multiple attempts to kill them in the past, and both have proven their worth over and over again in surprising ways. Like the ancient B-52, that has been reborn over and over again to carry out missions it was never conceived for, these two aircraft have proven the value of a design that does one thing very well but isn’t all things to all people for all missions. Hated by the bean-counters and mega-defense contractors because they are such sturdy hedgehogs of the air, these old soldiers stand their ground in one corner of “mission space” against all comers. In this they are the opposite of what Defense Secretary Hagel says will replace the A-10, the gold-plated Swiss-Army-Knife F-35, which tries to do everything for everyone everywhere and, in doing so, does nothing extremely well. Both the Warthog and the Dragon Lady have very vocal fans in and out of Congress. Time will tell whether they finally fall to the dreams of the budgeteers and bloated defense contractors. Errol Morris goes mano-a-mano with former U.S. Defense Secretary Donald Rumsfeld and emerges with something of a draw in “The Unknown Known,” a coolly hypnotic conceptual sequel to Morris’ Oscar-winning Robert McNamara study, “The Fog of War,” by way of 2008’s Abu Ghraib docu “Standard Operating Procedure.” Ranging over familiar material, but made vivid by Morris’ fecund associations and invigorating stylistic flourishes (including a superb Danny Elfman score), this as-yet undated release from Weinstein Co. day-and-date label Radius will face audience Iraq fatigue at the theatrical box office (where “Fog” grossed an impressive $4 million domestically), but should attract plenty of curiosity seekers on VOD and during its eventual broadcast premiere via co-producer the History Channel.